The sun continued to shine as I made my way east through Washington. I had plenty more to see and taste, but first I had to eat some chocolate. Jordan from Tri-Cities Convention and Visitors Bureau met me for breakfast at the Courtyard Richland early in the morning. I was a bit curious why we needed to get up early to stop by a “Country Mercantile,” but that question was answered when we got there. This was no country store, this was the country store. As we toured with Max, I saw aisles and aisles of local products from produce to sauces to to tamales. This family-owned business has a place to get fresh made sandwiches and an area filled with over 40 flavors of homemade ice cream – not far from all the homemade fudge in every flavor imaginable. 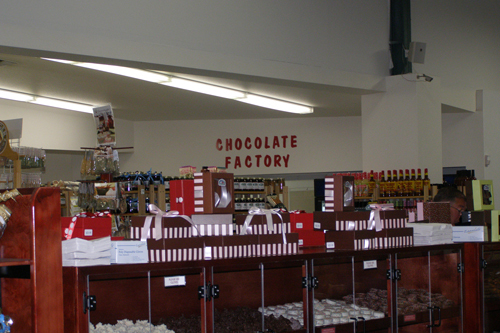 And, in the back, there is a chocolate factory that would make Willy Wonka jealous! I left Country Mercantile with some goodies (it’s worth a trip just for the Big Foot, full of nuts, caramel and chocolate), not imaging a better place to stock up between two wine regions. 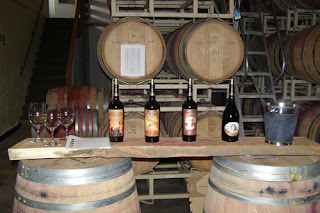 We were heading to my last stop in the Tri-Cities, Preston Premium Wine. A self guided tour takes you through this winery, offering plenty of seating if you just want to sit and sample for awhile. I enjoyed the wide selection of estate grown wines here, especially the 2009 Long Tail Lizard, a pomegranate and Riesling based wine which is sangria-like and not too sweet. Their just released 2009 Sauvignon Blanc is also a winner, presenting an earthy nose with a finish that’s a lemony floral. I was met at Preston by Erica Waliser, Public Relations Coordinator for the Washington State Wine Commission. She was leading me to Walla Walla through the green rolling hills, where we saw more hops than grapes for awhile in one of Washington’s best known wine regions. Our first stop was at Spring Valley, a small, family owned and run winery under the Chateau St. Michelle brand. It is literally in the middle of nowhere and they only have a few wines to taste by appointment, but it was a great way to introduce me to what Walla Walla is all about – deep, rich, fruity reds. Spring Valley offers only six wines right, all reds and all named after members of the family, I’d recommend them all, especially the 2007 Uriah, a blend of mostly merlot, with cabernet franc, and petite verdot for a more complex taste and the 2007 Frederick, cabernet sauvignon, merlot and petite verdot mixed into a deep rich color and full of berries. From Spring Valley we headed to Pepper Bridge, where we tasted those wines over lunch. We relished both with some incredible views of the vineyards in front of the Blue Mountains from the new location that were so great I wasn’t sure if I was looking at a picture or out a picture window. We were joined by winemaker Jean-Francois Pellet for a delightful hour, highlighted by their brand new 2010 Amavi Walla Walla Valley Sémillon, which includes a bit of sauvignon blanc to up the earthy citrus taste. 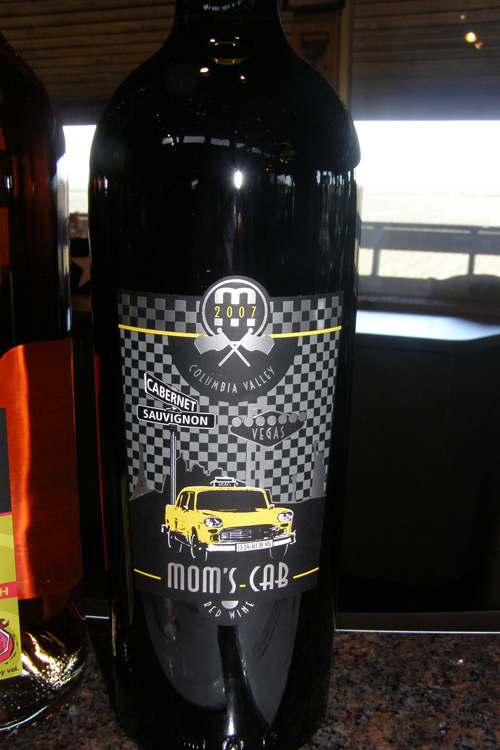 With our sandwiches from the Graze Deli I also took notice of the 2008 Pepper Bridge Merlot, with a bit of cabernet franc and a touch of malbec to give you a black cherry and licorice scent before the fruit fills your mouth with baker’s spices – cinnamon, clove and maybe some nutmeg. Jean-Francois explained his feeling on very low impact to the wines because he believes that it should all come from the grapes and I couldn’t argue. 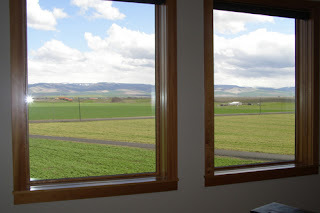 I checked into my apartment at Walla Faces Inn, right in the center of downtown. Erica picked me up a few hours later and we headed down to Seven Hills Winery. 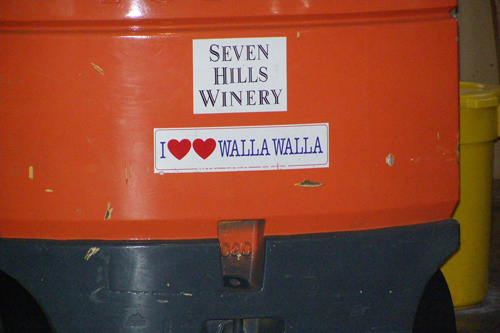 Casey and Vicky McClellan actually originally had their winery in Oregon, which I soon found out actually has vineyards within the Walla Walla AVA so many around here continue to use grapes from both states. Vicky poured me some great 2009 Seven Hills Oregon Pinot Gris, which overwhelmed my nose with citrus and pineapple, but was light and easy on the palate. The next winner here was the 2009 Riesling, made from three different vineyards in three different areas. It seemed to pick up the best of all worlds, starting out with lemon and grapefruit and giving me a long apricot finish. We couldn’t stay long at Seven Hills because we were having dinner next door at Whitehouse-Crawford with the Chad Johnson and Corey Braunel, also known as the Dusted Valley boys. This duo (who married sisters) is actually from Wisconsin, but they’ve settled down in Walla Walla, Washington and made some wonderful wine. I had actually tasted a bit the week before at their tasting room in Woodinville, loving the 2009 Boomtown Pinot Gris and the 2008 Tall Tales Syrah (which has a touch of viognier to soften it). The dinner was quite an experience with two guys who love wine as much as they love to make it. We told stories for hours as other vintners came by the table to say hello. I felt like I really and truly was in the middle of this town. 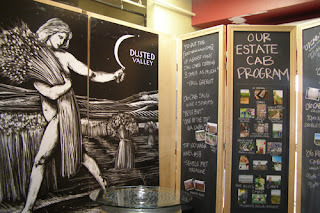 The 2010 Dusted Valley Rose was a tasty blend of grapes with a hint of pepper and the 2009 Boomtown Unoaked Chardonnay was superb. I learned how even though the winery is here, their oak comes from Wisconsin and the super tight grain helps bring out the best in their wines. I also tasted another wonderful chardonnay the Old Vine Dusted Valley, which brought in some banana to the fruit-filled mix. As for the food at Whitehouse-Crawford – Duck Terrain, local goat & sheep cheese, Fettuccine with Lamb Ragu and Salted Caramel Ice Cream – I couldn’t have asked for any better way to end the day, my first of two in Walla Walla. Sounds like a terrific time in WW. Next time at Whitehouse, try the smoked trout salad & the basket of fried onions! Thanks, Bob. Unfortunately, I'm allergic to fish, but I enjoyed a variety of fine dining (and wonderful chefs) throughout Washington.